Well, Nuffnang, the ever-entrepreneurial Lady Melbourne and some other talented people got together to host Fashionopolis, the first gathering of fashion bloggers in Australia – 150 of us, apparently. We were treated to a day of talks, discussions, yummy food and the chance to network in person instead of just over the internet. I’ll talk a little about what I learned from the day later, but this post is inspired by one of the lessons – put your own spin on things. There were 150 bloggers at Fashionopolis, and if we all blogged about the event in the same way it would be pretty boring, wouldn’t it!? I can’t compete (and I don’t try to) with people who have amazing cameras, and although I do a street style-type post now and then, that’s not really what I’m about either. So instead, I present to you the DIY ideas I spotted on the day. The first is from Kyra Pybus, who has a “small, smart” PR agency (and a blog, of course). Kyra also has a rabbit called Bijoux who is not averse to a spot of customisation. 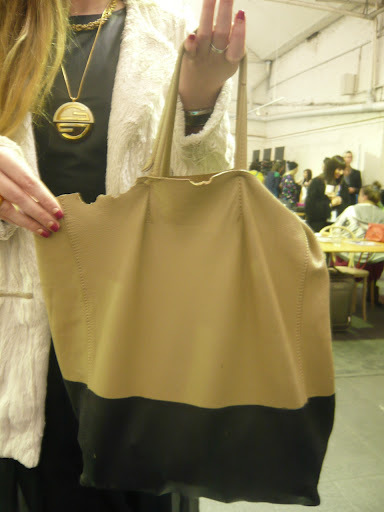 This is Kyra’s Celine bag from Madam Virtue after Bijoux had finished her work. For those of you who don’t have a rabbit, you could probably achieve a similar look with a holepunch. Or you could ask Kyra to borrow Bijoux – I’m sure she’s quite ready to lend her out after this little episode! 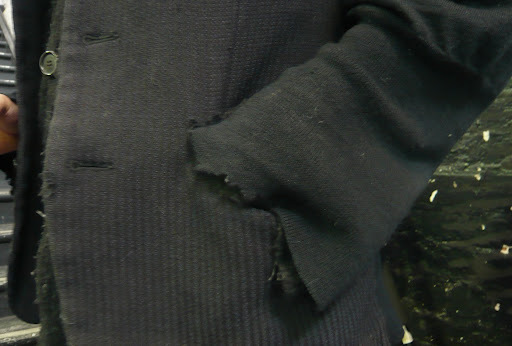 Kyra’s boyfriend Nish has also had the bunny stylist do some work for him – note the “newly nibbled” look of his cuffs (although Bijoux possibly had help from her housemate Beaky). Cheryl from BusiChic doesn’t have a furred or feathered assistant so she has to do her DIY herself. She’s so busy (and chic!) 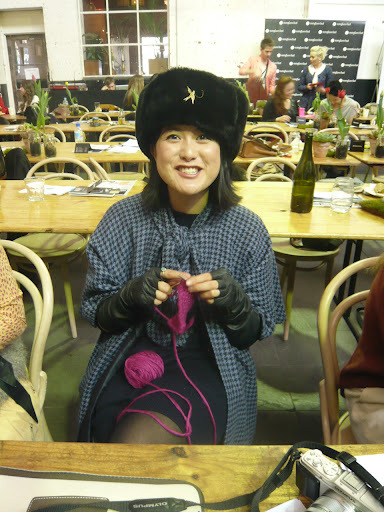 that she was knitting a scarf while listening to the talks. Multi-tasking, old-school style! 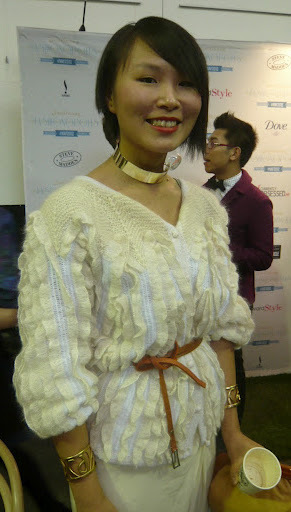 Continuing with the wool theme, here’s Cecylia looking calm despite being all ruffled up in a fabulous vintage knit. 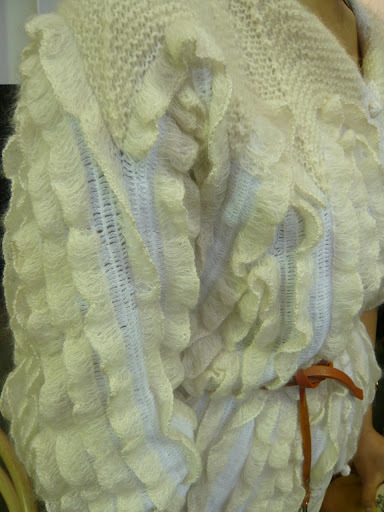 Actually, it’s probably not a knit, at least not completely. I have a feeling that the ruffles may be crochet, or even fourche work, which I read about in a pattern book from the early 1900s and have been trying to find out more ever since (yes, history buffs, I will eventually get around to posting scans of the book!). Let me know if you’ve ever tried it? I had a nice surprise when Camille approached me and said she read (and liked!!) my blog. I certainly don’t have as many readers as some of the big bloggers, so it’s always gratifying to know that someone out there is listening (well, looking and reading, not listening, but you know what I mean!). 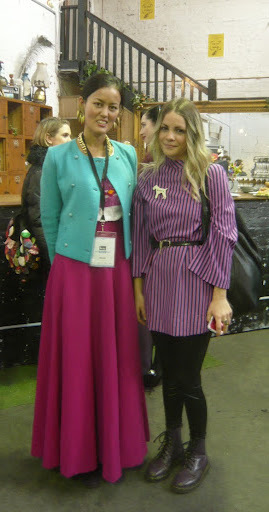 We’re both in vintage – Camille’s wearing her mum’s dress (pretty funky mum, hey!?) and I’m in jewellery that I made myself, a jacket I got for $3 at a Tokyo jumble sale, pink skirt from an op shop in Dandenong and a top that a friend gave me from a Tokyo flea market. Here’s a close up of it – how could anyone have sold it!? I think the former owner must have bought it on a holiday (in South America?) and then decided not to wear it when they got home. 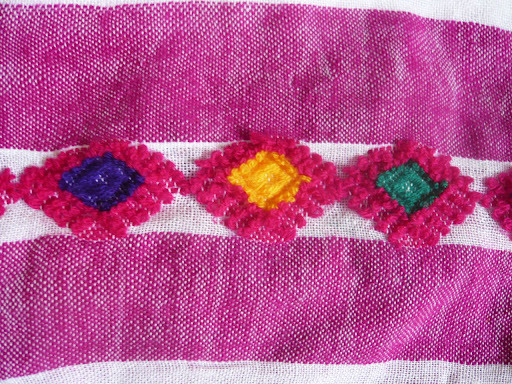 Check out some of the weaving detail! 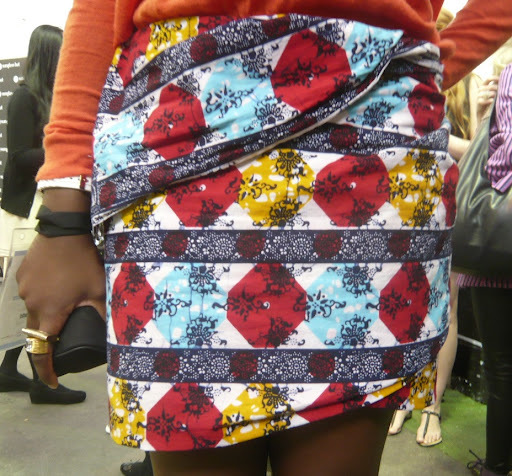 Sticking with the travel theme – Esther from Estelle La Mode is wearing a skirt that is essentially just a length of (extremely covetable) African printed fabric that she’s wrapped around her waist. Super easy – but super stylish when done as well as this, with such out-there fabric! 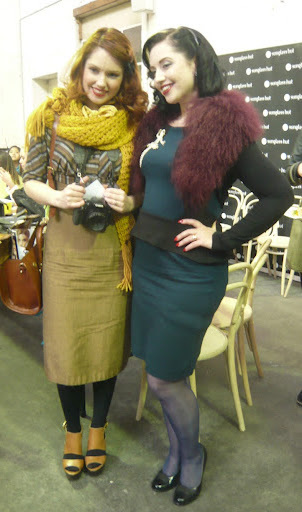 It’s always a treat to see what retro-inspired fabulousness Marianne from Esme and the Laneway is wearing – and when she gets together with Candice from SuperKawaiiMama… well… it would be hard to find more divine daywear than what this duo have on! 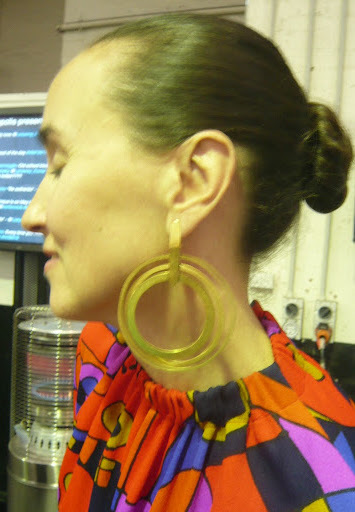 … as would this stunning piece on Alison Waters, who is here with Patty Huntington. These two are a lesson in wearing what works for you regardless of trends. Alison is chic personified in her fitted ’40s-style navy dress, black accessories and brown bits & bobs (ie gloves and shoes) while Patty favours bold prints and colours and loves big earrings (hmm, sound like someone you know?!). When I complimented her dress she reminded me that she bought it on a trip to the Chapel Street Bazaar – with me – a few years ago! 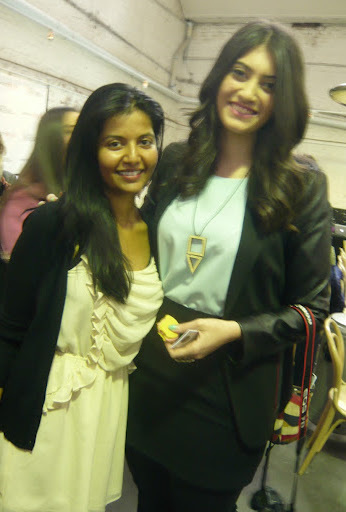 Sevan from Seven Autumn Leaves made her own jewellery too (she’s on the right, with Diya – who does too much for me to remember it all – on the left). 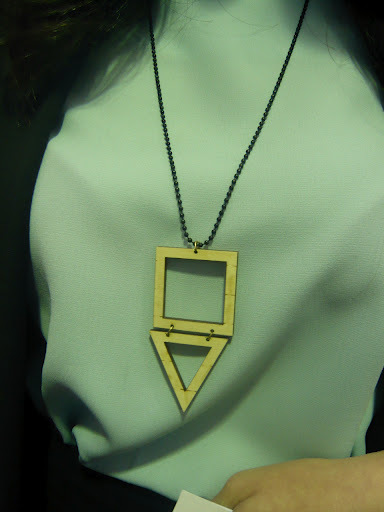 Here’s a close-up of Sevan’s necklace in laser-cut wood. Here’s some more DIY neckwear – on a guy! Yes, there were guys at the event, although they were few and far between. 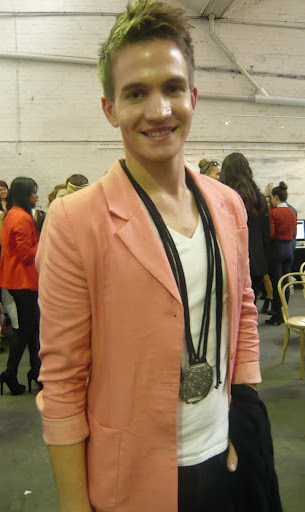 This is James Banham, writer and one of the few guys I have met who can wear a blazer in this colour with such panache! 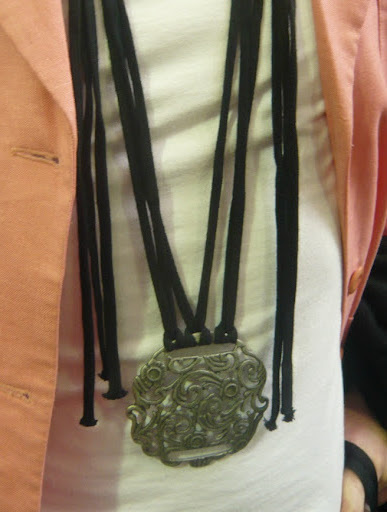 James made this necklace out of a belt buckle and some shoelace-stringy-things. It’s the perfect wintery edge to what could have been a too-summery look. Here’s another guy with inspiring style (well, he is involved with his wife’s design studio – I think – so it’s hardly surprising!). 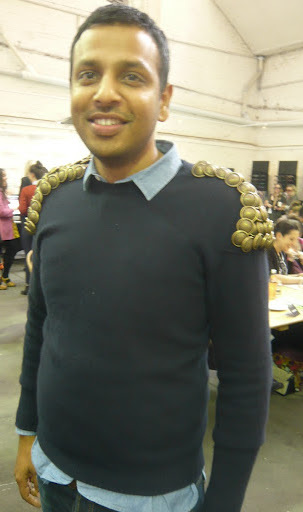 He’s wearing a jumper from Burberry, with lots of shoulder bling. 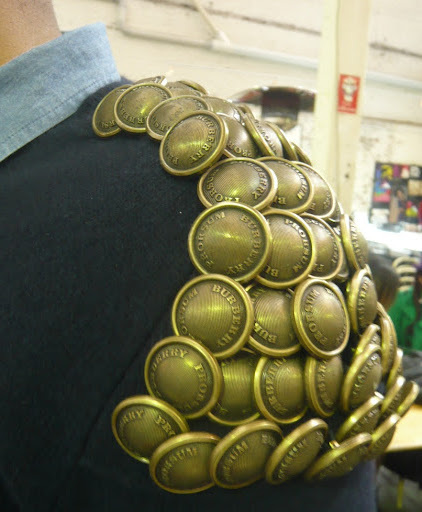 If you’ve got huge bags of buttons just sitting around, here’s an excellent idea for what to do with them!! 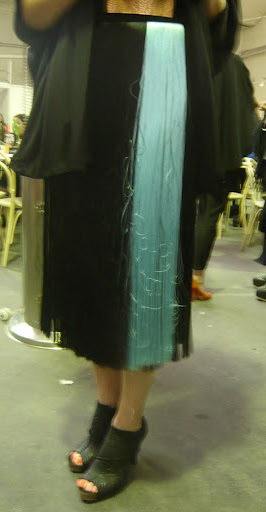 Likewise, if you are fortunate enough to be blessed with bags full of fringing, you could make a skirt like this one worn by the owner of Halcyon State. Ice blue and black – a combination that could work for winter or summer, depending on how you style it. 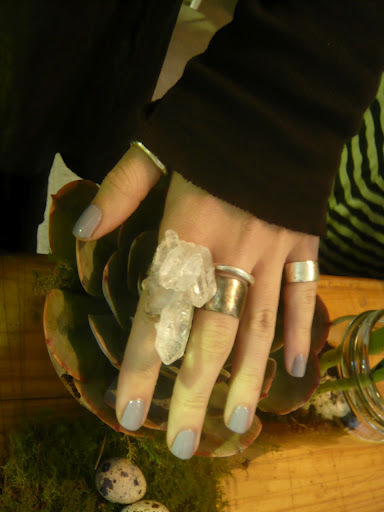 If you like DIY then you should put a ring on it… or make one, like Alicia from Sea of Ghosts. Look at that gorgeous rock she’s rocking (actually I think it’s a mineral, but you know what I mean!)! So there ends the pretty picture show, and here starts the bit I mentioned at the start of this (rather longer than planned) post about what I learned at Fashionopolis. The event was about quite a few aspects of blogging, including monetising, online behaviour and defining your blog’s “voice”, and I thought it was a good opportunity to talk a bit (within this post, I mean) about why I blog. While I’d love to have vast sums of money flung at me for posting my musings on the internet, it is very obvious to me that this is not going to happen. I respect and admire other bloggers who not only take inspirational photos of their personal style (or others’) but are savvy enough to link up with brands and get sponsorship or are paid for advertising, but for fashion bloggers, at least, I’m fairly sure the saying “you’ve got to spend money to make money” rings true. As my (tiny, yet faithful – thank you all!) 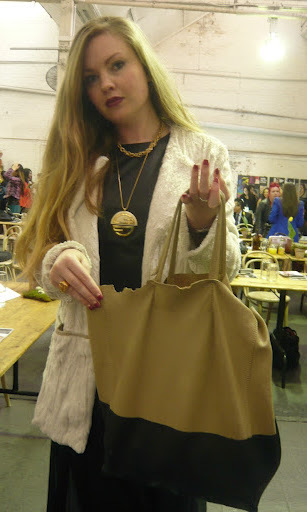 readership knows, I’m one of the world’s biggest tightarses, and I either make my own clothes or buy them from op shops – which are fairly unlikely to throw cash my way regardless of how shamelessly I plug them on my blog! When I commented about this to another blogger she told me that there is some kind of app which lets you link to similar items to what you are wearing (even if it is vintage), thereby allowing for monetisation opportunities. So theoretically, even if I were wearing outfits which were completely sourced from op shops or made by yours truly, I could still capitalise on readers wanting to emulate my style. However, as I am also an advocate for sustainability and all that is eco-friendly, it would be somewhat hypocritical for me to be encouraging rampant consumerism! So there goes that idea (damn you, conscience!!). At least this means you know that I only blog about things that matter to me and that I believe in, and which I also hope to interest others in – which is of course true of the bloggers who are lucky enough to be earning an income from their blog too. Case in point – Lady Melbourne was offered an advertorial kind of deal from a food company but she turned it down because she didn’t think it fitted her blog, she’s not a food blogger and her readers would wonder why she was talking it up. She knows she can’t be everything to everyone and does not attempt it, and nor do I – I’m not saying it’s against my principles to wear and talk about expensive designer clothing, but (even if I actually had expensive designer clothing!) I’m more interested in fiddling around with op shop finds and giving my readers some refashion inspiration that is accessible, cheap, and won’t contribute to the environmental or social problems that the fashion industry is causing. Something else that was discussed was devoting large amounts of time (or indeed, your life) to your blog, which is of course a good idea if you want to attract more readers (and consequently, potential sponsors and cash). While I would never say that outfit bloggers have it easy as I know how much work they put into their posts, the irony for myself as a sometime DIY blogger is that the more time I spend blogging or making my blog more attractive, the less time I have to actually create the stuff that I want to show you on my blog! 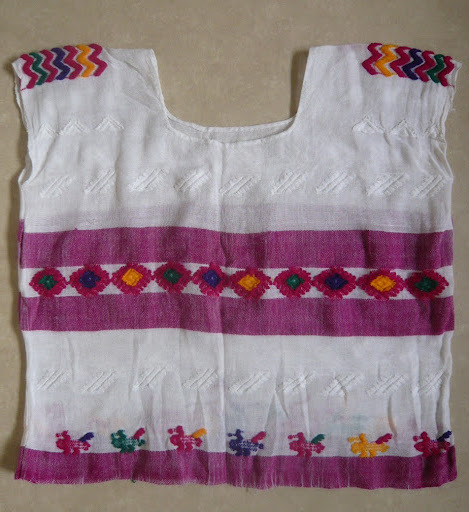 That said, I am painfully aware of how in need my blog is of a proper makeover – but there’s always a dress hem to be altered or accessories to be made, or a cat to be patted instead!! It’s actually taken me a whole day (on and off) to write this post because I’ve got distracted when looking up the URLs of the other bloggers I’ve mentioned, but it’s also because I’m looking after my (permanently disabled) dad while my mum is on holidays and it’s fairly much a full time job. To those bloggers who have a full time job AND a family (and a life!) – I salute you! 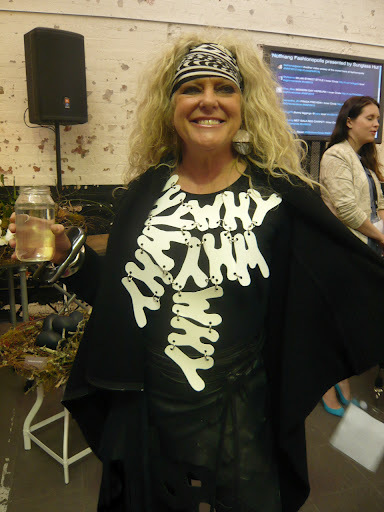 And to Lady Melbourne and everyone else involved in Fashionopolis – thank you for such a great event. Let’s keep making history together! Im sure something good will come of all your thrifting stitching and blogging, inspiring people is definitely a worthy cause!